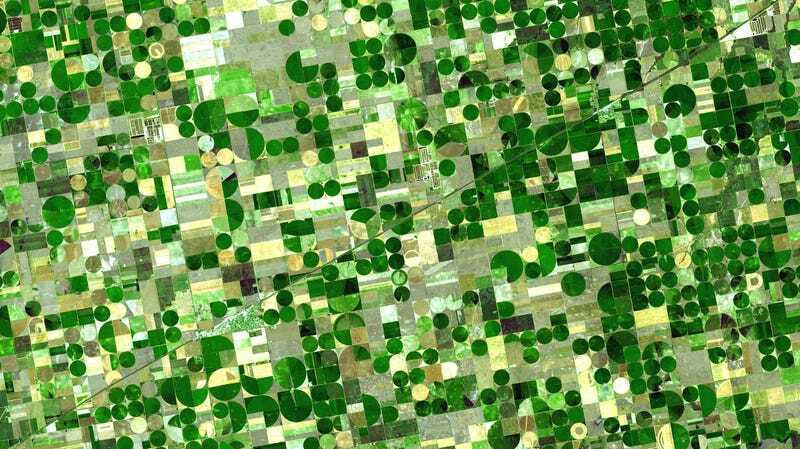 Crops in Kansas as seen from space. The technology at the heart of this research could herald an entirely new way of genetically modifying crops. Instead of having to wait for a plant to pass its newly-acquired traits onto the next generation, genetic changes would be imposed upon living organisms, a process known as horizontal genetic alteration. Hence the technology’s name—Horizontal Environmental Genetic Alteration Agents, or HEGAAs. For HEGAAs to work, a lab-developed genetic modification needs to be inserted into the chromosome of a target organism. And that’s where the insects come in. The system would utilize leafhoppers, whiteflies, and aphids genetically altered in the lab using CRISPR, or some other gene-editing system, to carry an infectious virus to pre-existing crops. Each plant would be infected with a transgene, triggering the desired gain-of-function, such as improved resistance to drought or frost. Needless to say, there are concerns about how this technology might be used—especially in consideration of its primary funder, namely DARPA, and by extension, the Pentagon. Reeves and colleagues contest the use of insects as a vehicle for genetic enhancement is a dreadfully bad idea because they can’t be controlled, and that overhead sprays to deliver the HEGAAs would be more prudent. DARPA, on the other hand, says insects are the only practical solution, as overhead spraying of HEGAAs would require infrastructure that’s not available to farmers. The Policy Forum piece also notes how transgenic virus-infected and genetically altered food crops could, conceivably, be made available to national or international markets, and that no regulatory framework exists to handle this. National security can be quickly jeopardized by naturally occurring threats to the crop system, including pathogens, drought, flooding, and frost, but especially by threats introduced by state or non-state actors. Insect Allies seeks to mitigate the impact of these incursions by applying targeted therapies to mature plants with effects that are expressed at relevant timescales—namely, within a single growing season. Such an unprecedented capability would provide an urgently needed alternative to pesticides, selective breeding, slash-and-burn clearing, and quarantine, which are often ineffective against rapidly emerging threats and are not suited to securing mature plants. The authors of the new report interpret this as “an intention to develop a means of delivery of HEGAAs for offensive purposes,” such as engaging in biological warfare. The introduction of this technology, the authors argue, would herald the advent of an entirely new class of biological, insect-dispatched weapons that could conceivably be used to introduce various deleterious characteristics. The authors further warn that this technology could motivate rival nations to develop similar programs. We also wish that the researchers had, at any point, contacted DARPA to request information about the program. Insect Allies is a fundamental research program with research being performed by university-led or affiliated teams. Those researchers are free to publish their results, and encouraged to discuss their research and engage regulators to advance the science in the most responsible and productive way possible. Had DARPA been contacted for information, we would have happily provided it. Additionally... there is abundant information on the program already publicly available. Blake Bextine, DARPA Program Manager for Insect Allies, rejects many of the claims made in the Policy Forum report. The purpose of Insect Allies, he says, is to prepare for the unpredictability of fast-moving or emerging threats to U.S. agriculture. As for the potential environmental impacts of HEGAAs, Bextine says DARPA and its collaborators are doing their due diligence. Should DARPA’s collaborators succeed in their projects, they will have developed gain-of-function treatments that can be delivered to the “right plants” and the “right tissue,” he said. These traits will be expressed for a limited duration, after which time the plants will return to their original state, according to Bextine. Also, insects could be engineered such that they’d die after just one day. At the same time, the specificity of the Insect Allies system, he says, contrasts with state-of-the-art technologies for agricultural threat response. No doubt, the implications of this pending biotechnology are vast. The authors may be overstating DARPA’s intentions, but the ultimate message of this report is being heard loud and clear: HEGGAs could be very dangerous.